Procedure Yellow & Black Sign CUSTOMIZE THIS SIGN! 9" x 12" or 12" x 18" Sign CUSTOMIZE THIS SIGN! 911 Emergency Sign Customizable Horizontal / Vertical CUSTOMIZE THIS SIGN! Emergency Horizontal Sign CUSTOMIZE THIS SIGN! Emergency Phone Numbers CUSTOMIZE THIS SIGN Emergency Red Text on White CUSTOMIZE THIS SIGN! Emergency Sign w/ Stripes CUSTOMIZE THIS SIGN! Emergency w/ Your Text CUSTOMIZE THIS SIGN! In Case Of Emergency Sign CUSTOMIZE THIS SIGN! 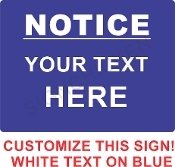 NOTICE Sign w/ Your Text CUSTOMIZE THIS SIGN!